Apple devices are set to get a new version of iOS. 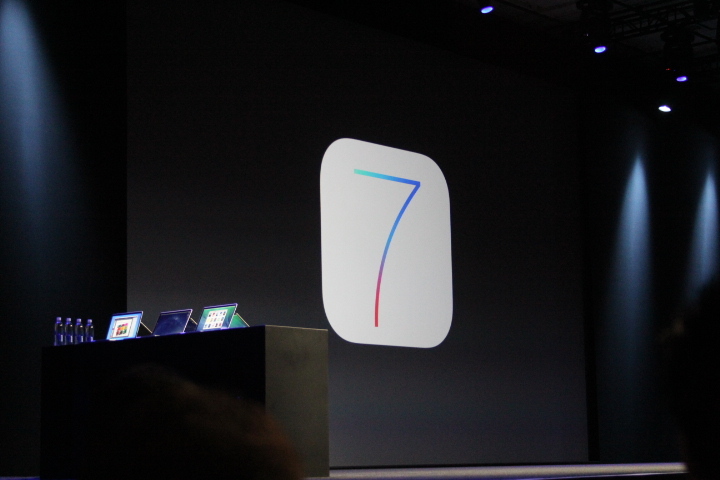 At the company’s Worldwide Developer Conference, iOS 7 was announced to the world. It’s being called “the biggest change to iOS since the introduction of the iPhone.” It’s packed with amazing new features and a brand new interface. The new iOS has a new palette of colors, distinct functional layers to develop hierarchy and order within the operating system. It also includes a sense of translucency to provide better context of your information designed to show more depth and vitality. The iPhone responding to your movements provides a parallax of depth and in many ways was designed to create an interface that was unobtrusive and differential, according to Apple’s Jony Ive. Users with iOS 7 will find that the typography and the liveliness of the home screen is apparent. The operating system carries over throughout the system the liveliness of the information so that it follows your every movement. The design has been made so that it works best with all the apps that you’ve used, including photos, messages, and an improved Game Center. The design of app folders have also been redesigned as well. iOS 7 now lets you swipe up from the device and get to the controls that you want right away, whether you want to play a song, turn on airplane mode, turn on a flashlight, or whatever else. Users can access it from anywhere, including the lock screen. iOS 7 has been built on industrial strength of OS X. Apple says that they’re all about supporting longer battery life when an app is running. 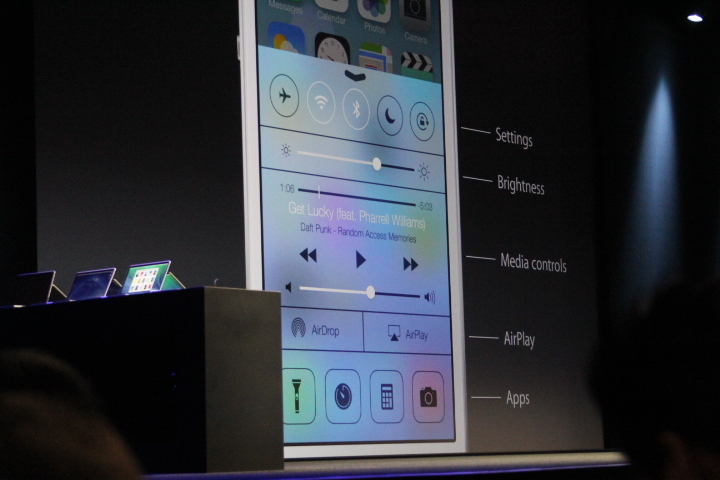 With iOS 7, multi-tasking will be available for all apps with greater battery life. Including intelligent scheduling, opportunistic updates, adapts to network conditions, and has push triggers. Safari is said to be the most popular mobile browser and now comes with a new full screen. Users can tap at the top to get a smart search field with one-tap access to their favorites and search URLs. 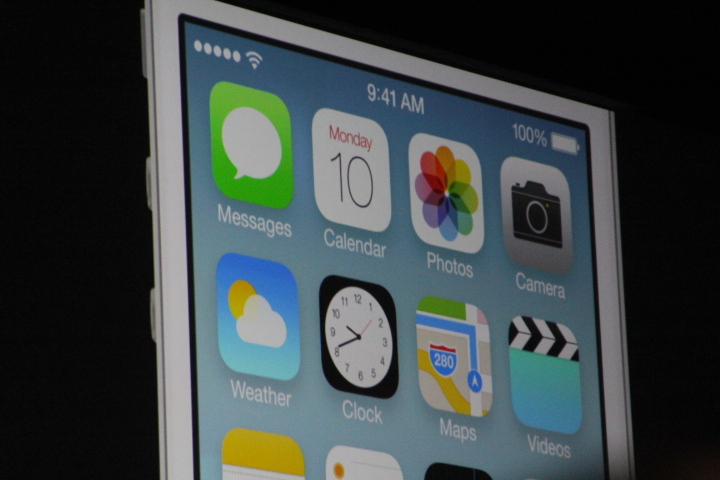 It also includes parental controls and iCloud keychain that also comes with Apple’s new OS Mavericks. Apple’s way to share files with people around them. When accessed, the app will pull up a share sheet where you can send photos, videos, and files with your friends and can pass it along to multiple people. In a bit of a pot shot at Samsung, Apple says that iOS device users will not have to bump devices. It uses the latest WiFi hardware and supports iPhone 5, iPad (4th Generation). iPad Mini, and iPod Touch (5th Generation). iOS7 comes with new camera support that allows users to swipe between multiple camera apps, whether it’s Instagram, the native app, or any others. Apple also just added filters. In order to help better organize photos into Moments, Apple has unveiled a new Photos app that is automatically generated as you shoot. With a retina display, it’s believed that users can make out patterns. The device can help you remember when specific photos have been taken. 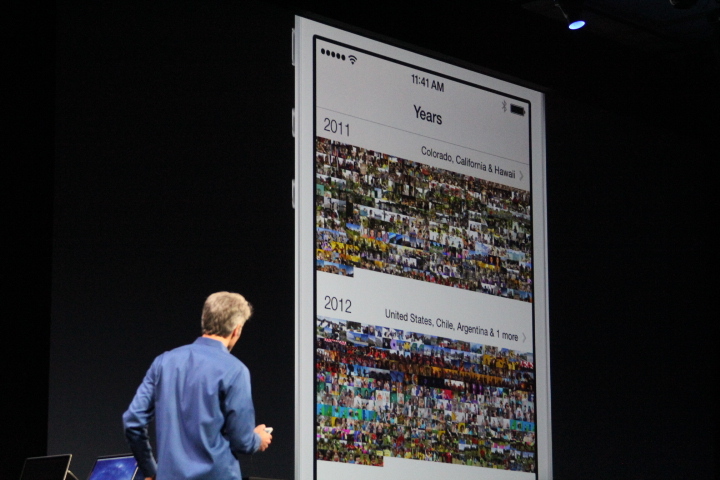 Photos can also be shared through Airdrop through Facebook, iCloud, Twitter, and email. Shared photo streams can also be made allowing people to collaborate when they’re on trips. Videos can also be shared with friends. 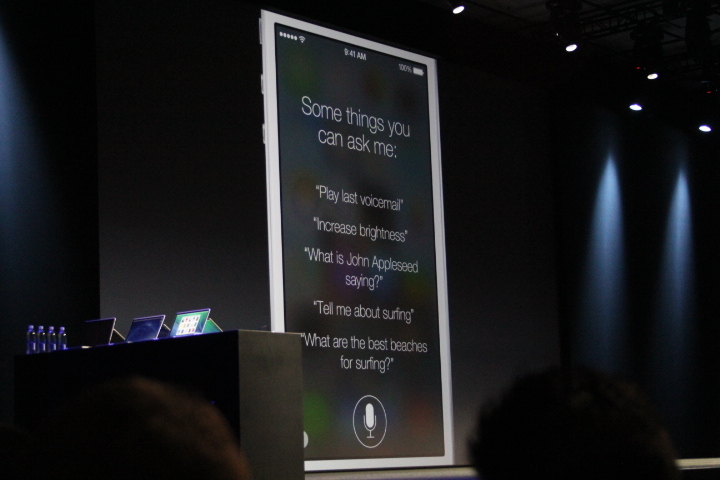 Siri has also been updated with iOS7 with new voices, both male and female, and additional language support for French and German. Apple says that it has gotten a lot smarter and can control device settings like voicemail, brightness, bluetooth, and more. Microsoft’s Bing search engine has also been integrated, as has Twitter and Wikipedia support. Now with iOS7, the App Store will update your apps automatically without prompting you. Additionally, it now shows you recommended apps based on your location. If you’re looking for iOS 7, you’ll unfortunately have to wait until this fall. 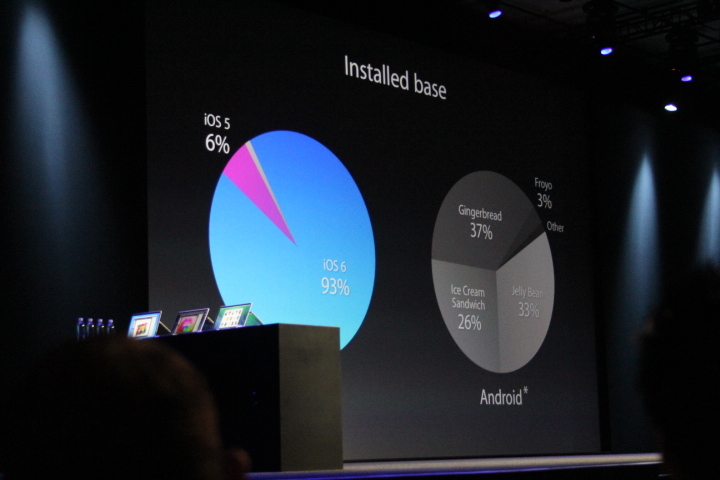 Developers at WWDC will receive the beta version today and an iPad compatible OS will be made available in a few weeks. The company says that it has sold more than 600 million iOS devices and people are using the devices more than anyone else. Cook says that just like as customers buy more apps, they are buying more iPhone and iPad devices, citing a IBM study of Black Friday mobile shopping last year. At their event, Cook said that iOS satisfaction is measured at 97 percent and that it has been rated number one in customer satisfaction according to J.D. Powers & Associate nine consecutive times. At last year’s conference, Apple revealed that there were approximately 365 million iOS devices in the world and 80 percent of them had moved to iOS 6, which was also released then. The current version of iOS offers users updates to Siri, sports capabilities, better search features, and international language support for Mandarin, Cantonese, French, German, and Korean. 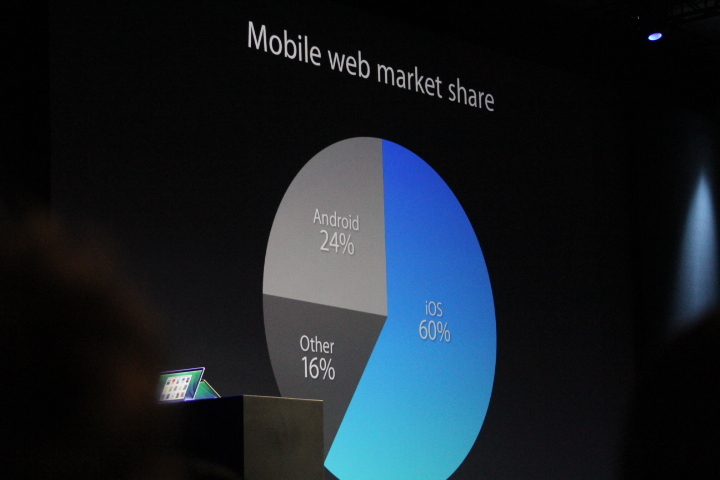 Today, the latest version of iOS is now being used by more than 90 percent of all its users. Cook compared it against the Android marketplace where 1/3 of all Google device users are on an OS that was released in 2010.
iOS 7 is perhaps the cornerstone of Apple CEO Tim Cook’s keynote today. At a recent appearance at the D11 conference, he said that the company has been focused on the elegance of a design that melded hardware and software tightly. What’s more, Sir Jony Ive, Apple’s Senior Vice President of Design, was said to have been working only on iOS 7.